Although the typical use of a shotgun is limited in their effective range, they are one of the most useful and practical tools in your arsenal for a lot of purposes like hunting, sports shooting, or in home defense situations. When it comes to home defense, a shotgun loaded with medium buckshot would be one of the ultimate tools for the protection of our family, our lives, and our homes. Designed to fire multiple projectiles per single trigger pull, a shotgun, also known as a scattergun, can fire shots, as well as solid balls. This shoulder gun was initially a smoothbore firearm, but later rifled shotgun barrels became available. While the shotgun is one of the most lethal firearms you can legally have, they are also among the most effective weapons out there. The main reason for this is the versatility to fire the widest variety of projectiles from your shotgun while engaging anything from small birds to two-legged predators, and even creatures as big as black bears. Since this type of firearm usually fires a lead shot, commonly accepted terms for shotgun cartridges are "shotshell" or "shotgun shell" whereas the empty shotgun rounds are often called "hulls." Shotguns may use thick paper or plastic shells with brass heads or all brass or all plastic including the head. Today, a shotgun uses plastic shells as a widespread ammo case material but at one time, the most widespread material was paper and brass or zinc cases that were excellent for reloading. Shotguns come in every type imaginable, but if you are fully committed and trained, any shotgun type will serve the purpose of being an offensive tool to protect your life and your property. Similar to rifles, shotguns use many of the same actions divided into four common types: break-action, pump-action, semi-automatic, and bolt-action. While the break-action shotguns can be found in single or double barrel configurations including side-by-side and over-under variations, the three other types are single barrel weapons. For the topic of our article, the pump action gun is a kind of shotgun that checks all the boxes requested by users. The most popular home defense shotguns are the pump-action, a.k.a. slide-action weapons, in which a single manual pump chambers a round, making them an extremely reliable and efficient weapon. The single shot shotguns belong to the break-action or hinge-action group of shotguns. Besides single barrel models, the break-action category also includes double barrel shotguns with barrels in the over-under and older, side-by-side configurations. Break-action shotguns are reliable and affordable but do not have magazines. Another practical type of shotgun for home defense is the semi-automatic, also known as a self-loading or auto-loading shotgun. Since it is the fastest form of operation for a shotgun, lots of people mistakenly call these guns “automatic shotguns”. The truth is that you have to pull the trigger for every shot. After that, the gun mechanism will eject the empty hull and load fresh shotgun shells from the magazine. Basically, the most common types of auto-loading shotguns available today are either gas-operated or inertia-operated. Like pump-action shotguns, autoloading shotguns usually have tubular magazines. Bolt-action shotguns are extremely popular in states where the law requires a shotgun for hunting big game. Resembling Mauser-type rifles, many bolt-action shotguns are repeaters, with the magazine and threaded barrels that specialize in shooting slugs. Besides classification by actions and operating systems, shotguns can be divided like other firearms by their caliber or gauges respectively. The gauge is determined by the number of lead balls the size of a barrel's diameter it takes to weigh one pound. For example, a 1/12th-pound ball fits a 12-gauge bore, while it would take 20 lead balls with the same diameter as a 20-gauge shotgun bore to weigh one pound. The general rule is the smaller the number, the more significant the barrel is. Currently, twelve-gauge shotguns are, by far, the most common weapons, but 16, 20, and 28-gauge are also popular. Also, the .410 bore, which is actually like a 68-gauge, is another popular, all-purpose gauge. For combat purposes, however, a 12-gauge is the most common shotgun caliber, but a 20-gauge is also a very potent round, that will still get the job done with a lesser chance of over penetration of a wall while saving you from a large bruise from the recoil. Unlike the 12-gauge model, 20-gauge shotguns offer 60% less recoil, but on the other hand, they deliver 60 to 75% less power compared to their big brother. Since there is no such thing as a free lunch, we can conclude that smaller gauges are better suited for those who cannot handle the greater recoil and are usually offered in lighter guns, opposed to 12-gauges, a more powerful option, which are larger and heavier firearms with fiercer recoils. What Makes a Shotgun Ideal For Home Defense? The deliberate noisy racking of a slide of the pump-action shotgun is an international way of saying "get out of my house," but also is the theme of many discussions and arguments. Anyway, if you want, use the rack sound as a deterrent, but a pump or auto-loading shotgun for home defense just makes sense. In the world of self-defense, reliability and effectiveness are ultimate features and shotguns are the best shoulder-fired weapons that accomplish desired effects. ​While some there are some complaints of low ammo capacity, you can outfit your shotgun with a side saddle ammo carrier, but remember that shotguns don't need many rounds because most shotgun fights end after the first hit. Home defense shotguns typically have 18 to 20-inch cylinder barrels; it means they come without a choke for a tighter shot group. While this length of barrel keeps the gun short and maneuverable, be cautious of making a “sawn-off shotgun”. Additionally, anything less than 18 inches causes too much spread, a harder recoil, more muzzle blast, and increased muzzle flash. You should be aware that the minimum legal barrel length for a civilian-owned shotgun in the US is 18 in (46cm). With appropriate buckshot and slugs for home defense and additional features like adjustable stocks, a good set of sights, extended magazines, and a sling, the gun will become much easier to use in a fight. Throughout this article, you’ll move toward “tactical shotguns”, made for an explicit purpose but you’ll also find standard hunting/sporting models that can be easily adapted with a few features that will make them awesome for home defense. Below are our top picks for the best shotguns for home defense. Let's see why they made our list. 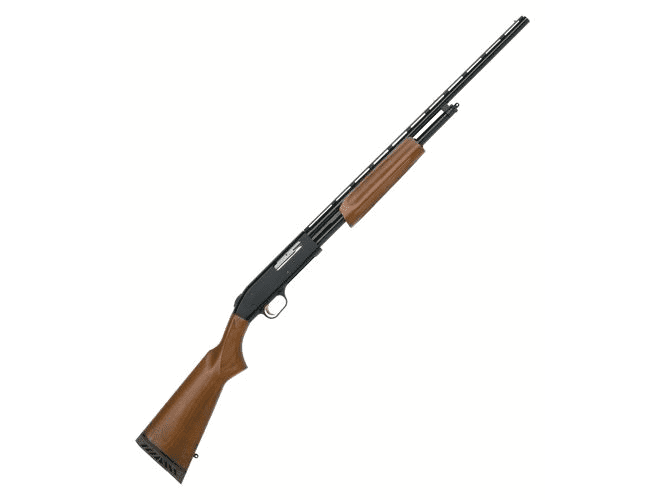 The gas-operated Mossberg 12-Gauge SPX 930 is the tactical derivative of the excellent Mossberg 930 hunting guns. The main difference of the model designated as 85370 is a full-length black polymer stock with a built-in pistol grip. A fairly large circumference, its molded checkering and finger grooves ensure positive purchase, even with wet or sweaty hands. Another selling feature is an extended magazine tube under the 18 1/2-inch steel barrel which allows for 7+1 or 6+1 capacity depending upon whether you’re using 2 3/4” or 3” shells. However, the only weakness may come from that magazine extender as it may bend during extended use. Its 18.5" cylinder bore barrel is not threaded to accept choke tubes, so it is a perfect scattergun for close quarter situations. The Mossberg 930 SPX comes with a tang-mounted ambidextrous safety and a drilled and tapped receiver with a Picatinny rail for convenient scope base installation. This tactical shotgun is equipped with an XS ghost ring rear sight and M16-style red, fiber-optic front sight protected with 0.5 inch high wings on both sides. The Mossberg 930 SPX comes with a charging handle on the right side of the action just like AK style rifles and features a cocking indicator that protrudes from inside the front of the trigger guard and a "quick empty" magazine button for easy unloading. The earlier 930 SPX tactical models are regularly upgraded, so unlike older guns, the new production is better-made, featuring a sling swivel stud on the bottom of the polymer forend and a more reliably secured top rail. 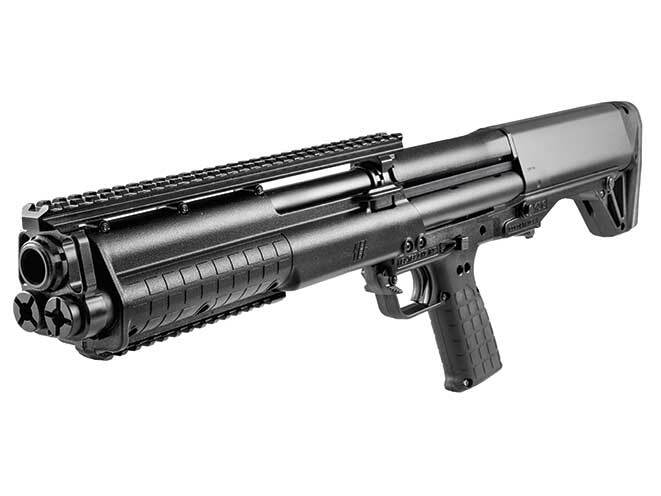 The Spartan Mossberg 930 SPX is a perfect choice for an entry-level, semi-automatic defensive shotgun considering its reliable cycling, well-placed controls, and affordable price. Just like most Mossbergs, the Model 50104 is the best balance of battle-proven features, simplistic design, reliability, and price. 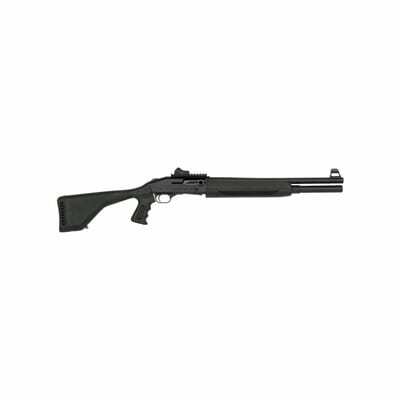 Although this Mossberg shotgun comes in a soft-shooting .410 caliber, it is an excellent firearm for large and small stature people alike, having a great low recoil option for home defense and is usable by anyone that can shoulder it. The classic shotgun features Model 500 twin action bars, dual extractors, tang safety, and a fully ambidextrous design, fitted to a 24-inch vent rib barrel topped with a fixed, full choke for the tightest possible patterns. This Mossberg Shotgun 500 series has the 5+1 capacity with 2-3/4” shells and 4+1 with 3" shells. It still comes with a hardwood stock and forend, but the one-piece forend/action tube with action bars is nested in the plastic instead of attached like older models to a separate steel action tube. It may not have tactile styling, but it is highly adaptive for home defense tasks especially for those that are not able to take the recoil of a heavier gauge. For that kind of business, you may purchase an 18.5-inch cylinder choke security barrel, remove the magazine plug, and load it up with some quality buckshot loads. If you are looking for something that is quite affordable and really durable, the Mossberg 500 series of shotguns may be for you. Another legendary model from a world-renowned manufacturer is Remington`s Model 870 Express pump-action shotgun. A modest version of the world-famous Model 870 Wingmaster. While the stock and minimalist forend are made of slick black plastic, the blued steel of the receiver offers maximum strength and reliability.The versatile 870 Express is a value-priced workhorse equally useful for hunting waterfowl, upland game, and deer, or as a basic tactical shotgun in your home. 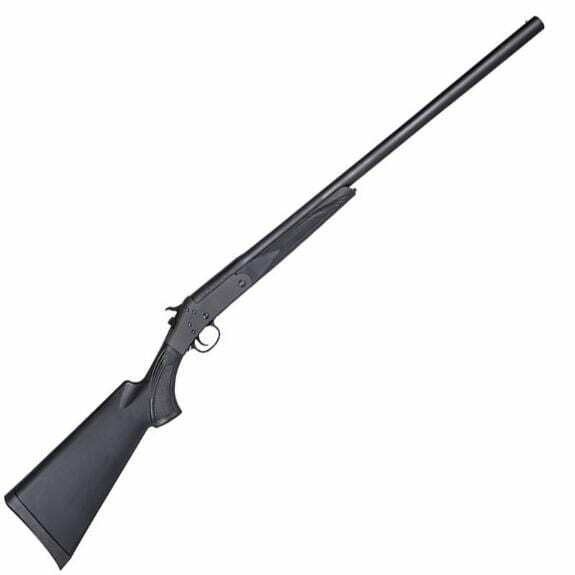 The 870 model with number 25569 sports a 26-inch vent rib barrel and a single bead sight. The barrel has a matte blue/black, bead-blasted finish and comes with one Modified Rem Choke screw-in choke tube. The barrel is chambered for either 2-3/4" or 3" shotgun shells and being a robust shotgun it is entirely insensitive to different types of shotgun ammunition. Like all Model 870 shotguns, the Express features original double-action bars and the M870’s cross-bolt safety. Being located at the rear of the trigger guard, it is non-ambidextrous. Another caveat with this gun can be maintenance because it is a little bit tricky to get together once you have cleaned it. Since most other pump-action scatterguns have alloy receivers, the Remington 870 provides a more solid feel and balance due to the steel receiver. This remarkable shotgun has been the touchstone for slide-action performance for almost 70 years. As the best-selling shotgun of any type in history, the Model 870 is a good value for the money and is the best shotgun you can get. The Italian firearm maker Benelli is known as a manufacturer of the best combat shotguns on the market. However, their SuperNova is an ideal pump-action shotgun for hunting, sport shooting, and self-defense. The Benelli SuperNova is a strong 12-gauge shotgun, made from the most advanced materials for extreme durability and reliability. Since the SuperNova with production number 20100 is made to handle cartridges from 2-3/4in (70mm) to 3-1/2in (89mm), it boasts Benelli's ComforTech recoil reduction system that cuts the recoil by 52% over similar pump-action shotguns, making a big difference on your shoulder. This system also reduces muzzle rise for fast follow up shots. This SuperNova variant comes with a 28" premium steel barrel and three screw-in choke tubes (F, M, IC) to improve the SuperNova's versatility. Additionally, the barrel sports a ventilated stepped rib with a mid bead and red-bar front sight. 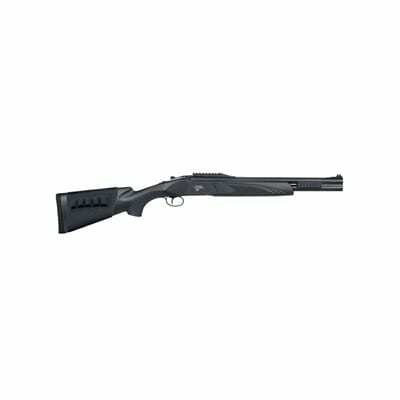 The Benelli SuperNova is famous for its one-piece receiver and interchangeable polymer stock with spacer kit to adjust the stock’s length of pull and enhance fit and comfort. The ridge-checkered forend pushes the rotary-head bolt back with dual-action bars. One handy feature is a magazine disconnect button located on the polymer forend, which allows you to quickly unload a round from the chamber without releasing another round from the tubular magazine. Another useful feature is a magazine cap that can also be used as a tool for the trigger assembly. The safety button is placed at the trigger guard, which may be less accessible for shooters with short fingers. Benelli constructed the SuperNova with integrated sling attachments to allow you to carry around this eight-pound shotgun with a sling. This typical Italian design is built to last through harsh weather conditions and as a very adaptable firearm, you can use it either for hunting purposes or for self-defense. If you are looking for an ideal home-defense shotgun, most discussions will be about the merits of the pump or semi-auto, completely neglecting another class of shotgun that has served well for centuries, a break-action, double-barrel scattergun. While Mossberg catalogs the Maverick Thunder Ranch HS-12, this two-shot weapon is produced by Khan, a manufacturer from Turkey. Therefore the gun is available either with a polymer or a fine Turkish walnut stock. The Thunder Ranch HS12 over-under includes two 18.5-inch barrels with three-inch chambers that are corrosion-resistant and chrome-plated. While the newer iterations feature cylinder-bore barrels, previous versions came with removable choke tubes. The HS12 currently ships with Picatinny rails on the left and right sides of the barrels for weapon light mounting and a neoprene stock shell holder that slips over the buttstock. Another tactical update is the addition of a steel segment of railing soldered to the top barrel above the receiver that also doubles as the rear sight, whereas the front sight contains a fiber-optic rod. The mechanism consists of robust dual locking lugs and a tang-mounted ambidextrous safety that also serves as a barrel selector. However, there are no ejectors on the HS12 which slows reloading a bit since you have to clear fired shells manually before you can reload. Whereas a double-barreled, 12-gauge, over/under design is popular with sporting and hunting guns, Mossberg outfitted this model for home-defense by adding a few features that address the requirements needed in a home-defense scenario. The Mossberg Maverick HS12 shotgun features a short overall length of 36.5 inches and weighs just 6.25 pounds, making it a classic example of a home defender gun offering simplicity and reliability when confronting danger inside the confines of your home. While the shotgun intended for home defense represents the absolute power one gun can have, you should be aware of some inherent weaknesses and limitations. Without question, shotgun reliability makes them useful for many different roles, but they also have few disadvantages. Fortunately, most of these downsides can be overcome with training and simple common sense. The distinct disadvantage to smooth barreled weapons is their short range, but using the best choice of defensive ammo, you will establish an optimal effective range for a defensive encounter. Generally, birdshot is not very effective for home defense, and though buckshot is perfect for tactical applications, its efficiency is largely limited to roughly 25 to 35 yards. While the pellet’s diameter commonly ranges in caliber from .24 (No 4 Buckshot) to .36 (000 Buckshot), the war experience found that No. 1 buckshot (.30) was more effective than larger 00 (.33) buckshot. As a benefit, some shotgun barrels come with a choke, which is designed to keep your pattern tighter and give you a more useful range. In the end, the shotgun may use solid projectiles called slugs that allow you to extend your effective shotgun range up to 100 yards. Most home-defense shotguns are limited in capacity to 4+1 rounds since the shotgun shells are large and heavy. However, using side saddles and ammo carrying slings can help here. On the other hand, you may practice common combat tactics to fire two and load two rounds. Using this technique, it will keep you from ever running out of ammo. While the shotgun delivers a devastating punch to your target, they also have a fierce kick, especially with full power ammo. Generating 23 ft.-lbs. of recoil energy, the substantial shotgun kick is quite comparable to the recoil of the .300 Win. Mag. The solution is to avoid the most lightweight gun you can find, as the weight directly helps tame the energy created. In addition to gun weight, you can use reduced recoil loads, but this kind of ammo is recommended only for training. If you are looking for a shotgun for home defense or tactical situations, you will need only full power loads. This review of home defense shotguns should give you some insight into this gun category and why it is such a great option for many different people. When compared to handguns or rifles, it makes a pretty good case for embracing the shotgun as the preferred type of home-defense weapon, especially with shaking hands that lack fine motor skills or for poorly trained homeowners who are gun owners but not gun enthusiasts. The old myth you the can’t miss with a shotgun is just that, a myth, and you have to practice regularly with defensive gun-handling techniques, especially for reload drills and weapon manipulation.